Five months ago, after volunteering my home to host Pesach for my family, I thought: oh no, what did I just get myself into?! I have been married two years, just made aliyah recently, and now I’m going to host Pesach for 7 people for the first time? As the weeks passed and the upcoming holiday grew closer and closer I found more and more reasons to be anxious. So I made some lists, created some recipes, and just tried to be as organized as I possibly could. When Pesach was finally only a week away, I realized I had largely accomplished what I had set out to do. I was so prepared that I stopped being stressed. Turning over my kitchen took only a single night with some careful prep, like buying the counter covers, cutlery tray drawer inserts, cup holders, dish rack, etc. all while calculating when I needed to stop using my cooking appliances. I prepared some dinners in advance so that I could turn over my kitchen and not have to worry about food at the same time. Then came Pesach. And what is Pesach if not cooking all day, the thing I love to do most! Boy, did I cook. I have never cooked so much chicken and meat in my life. I love hosting, to be sure, but until now I have only ever hosted one meal per Shabbat— I’ve never even tried hosting both lunch and dinner in the same week. But Pesach was meal after meal, for 7 people each time. After cooking so much for chag, though, I decided that for the few days of chol hamoed I had, I would skip the cooking and just eat leftovers, or something simple, like matzah and cream cheese! That way I was able to relax and enjoy the beauty of Israel to its fullest, and even get a glimpse of the Prime Minister at a fun hike up north. I had fun at Aqua Kef (guys, you have to check it out if you’re a water sports enthusiast like me! ), an awesome hike at the ruins of the Montfort Castle, and some quality family time throughout. What it didn’t leave time for is weekday cooking, which is totally okay in my book! As you might remember, before Pesach even started I tested out a bunch of new Kosher for Pesach (KFP) recipes. I posted some of them already, and some you only got a glimpse of through my Instagram stories. This was one of the latter. So why am I posting a Pesach recipe AFTER Pesach, you ask? Because it’s just so good, it would be wrong to call it a “Pesach” recipe. It is so light and healthy, something we could all probably use right about now after a holiday like this one. The only thing that you have to swap out to make it Pesach-friendly is real breadcrumbs for KFP “breadcrumbs”, or you could even skip that ingredient altogether if you want to keep it low-carb. Even after Pesach when everyone wants a chametz-fest, I like to keep it healthy and not gorge myself. The recipe may seem complicated but don’t be daunted. The beauty of it is that it’s so customizable! Don’t like peppers or just don’t have them? Skip it! Like mozzarella better then gouda? Replace it! You can fill this sandwich up with whatever roasted veggies you have lying around. How do you think those za’atar-roasted baby peppers made it in? I had leftovers from a hummus platter and thought they might go really well. So, read through the recipe card and figure out which things float your boat and which just aren’t for you! Have fun! On a parchment lined baking sheet, place the mushrooms caps, gill side up. Spray with olive oil and sprinkle with salt and freshly cracked black pepper. Roast for 10 minutes. Meanwhile, mix the breadcrumbs with the olive oil and spices. After 10 minutes remove the mushroom caps from the oven. Drain the juices that have pooled in the center of the mushroom into a container and save— this makes amazing mushroom broth! If you have no need for the broth, keep it in the mushroom. 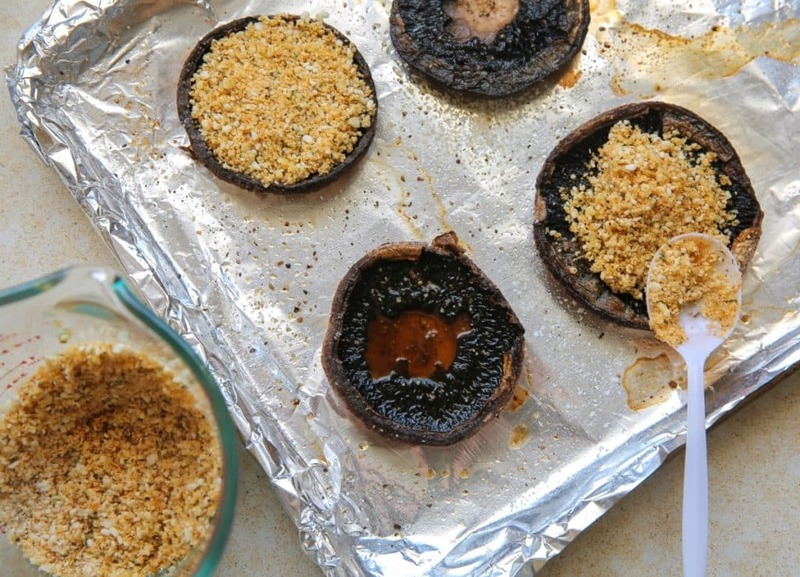 Top 4 of the 8 mushroom caps with the breadcrumbs and return to the oven to bake for another 7-10 minutes, until breadcrumbs are golden. At the same time, on another parchment lined baking sheet, lay down the tomatoes on half and the peppers on half. Drizzle both with olive oil and sprinkle the tomatoes with salt, pepper and garlic powder and the peppers with zatar, salt and pepper. Bake for 10-20 minutes, depending on your desired crispiness. 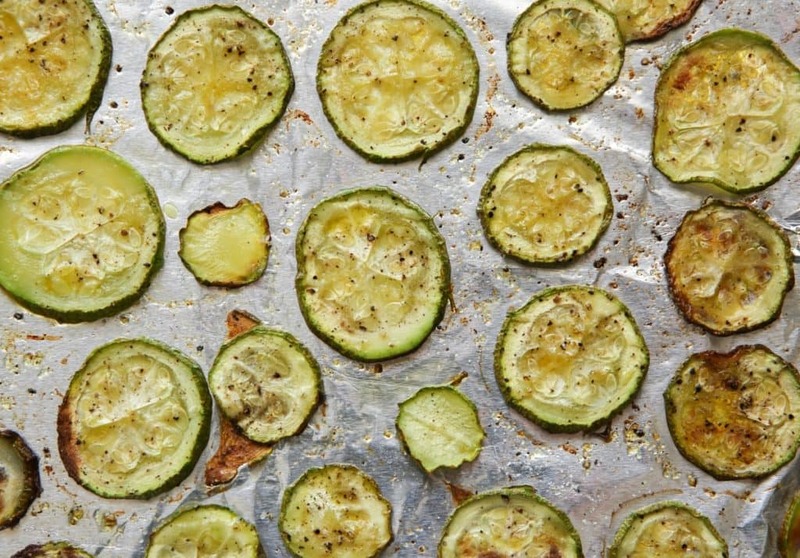 Follow the instructions for zucchini rounds and bake them now too. Mix the cream cheese, ricotta, scallions and oregano together and set aside. Take 2 mushroom halves, one with breadcrumbs and one without. Slather the cream cheese mixture on the non-breaded half. 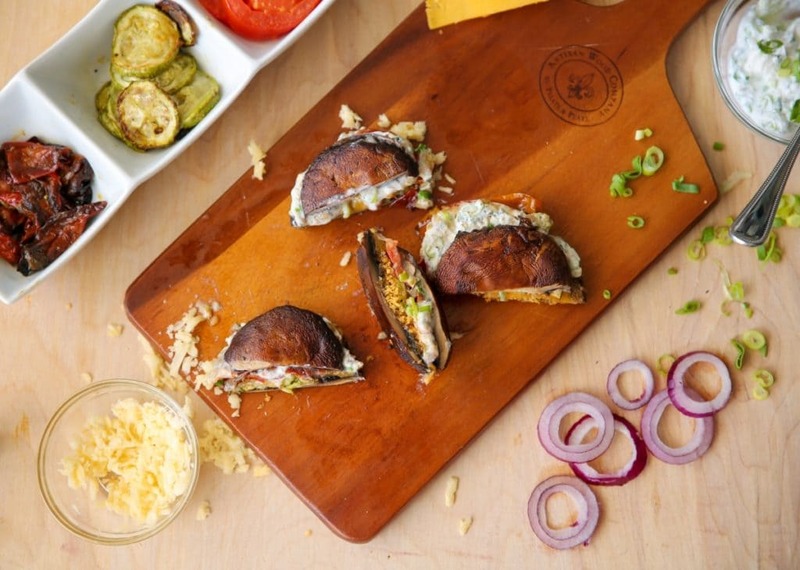 Top the breaded half with a slice of cheddar, zucchini rounds, red onions, peppers, tomatoes and shredded goat gouda. 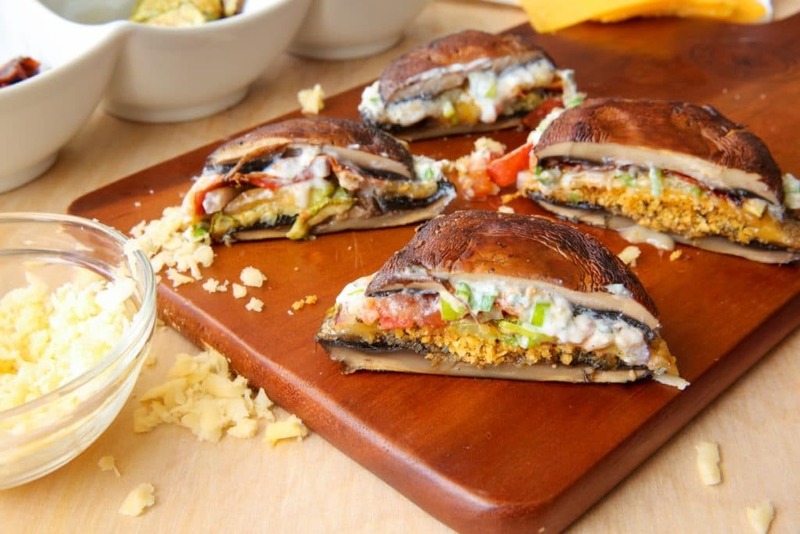 Place the non-breaded mushroom half on top of the stack to close off the sandwich. Spray a skillet with cooking spray and heat up over a medium flame. Gently place the sandwich in the pan and press down on the top half. Grill for 3-5 minutes on each side, until each side is golden and the cheese has started to melt. You can use Kosher for Passover "breadcrumbs" to make this sandwich gluten-free and KFP! Click here for the Zucchini Rounds recipe. Slice zucchini into very thin rounds either using a knife or a mandolin. Place them on a baking sheet lined with parchment paper. Drizzle olive oil and season with garlic powder, onion powder, seat salt, freshly cracked black pepper and crushed red pepper flakes if you like heat. Toss everything to coat evenly. Make sure they're in a single layer and then place in oven for 15 minutes. After 15 minutes keep a close eye on them because they go from perfect to burnt very quickly.